APRS-IS stands for Automatic Packet Reporting System Internet Service. It consists of a set of servers performing worldwide routing APRS data gathered by igates or sent by apps. There are two type of servers, tier 2 and tier 1 servers. Without digging too much into details, for users only tier 2 servers are of interest. Any APRS client software, be it mobile phone app, igate, DStar gateway or whatever software will connect to one of those servers. You do not chose a specific server, you usually configure your app/software using the APRS DNS round robin . There are many round robins to chose from, typically if you connect from europ you will use euro.aprs2.net and from north americ noam.aprs2.net. Off course European servers are connected to the north Americans. The DNS round robin ensures load is balanced across the tier 2 servers and if one server goes down it is totally transparent for the users. The tier2 servers have some sort of dashboard which can be accessed on port 14501, if you access http://euro.aprs2.net:14501/ you will get the dashboard of one of the European servers, the actual one depends on the DNS round robin. To connect to one of the APRS-IS server a password, sometimes referred as APRS passcode, is required. This password is not stored anywhere. It is actually generated out your call sign using a specific algorithm. Aprs.fi is nothing but another “app” connecting to tier 2 APRS servers (maybe it uses the tier 1 servers, not sure about that) pulling data from them and displaying this data onto a map in your browser. 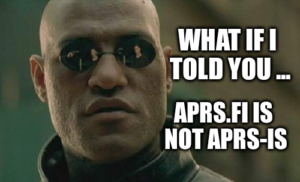 Yes, aprs.fi does exactly the what your mobile phone app is doing, yet on a larger scale. APRS.fi is just another APRS-IS client. When you connect to the APRS-IS network you do not connect to APRS.fi. APRS-IS does not need APRS.fi to work, yet APRS.fi is very valuable service provided for free to the ham radio community. Thanks for clearing this up! It’s an often misunderstood point about the back-end systems responsible for APRS and the front-end applications making use of them.